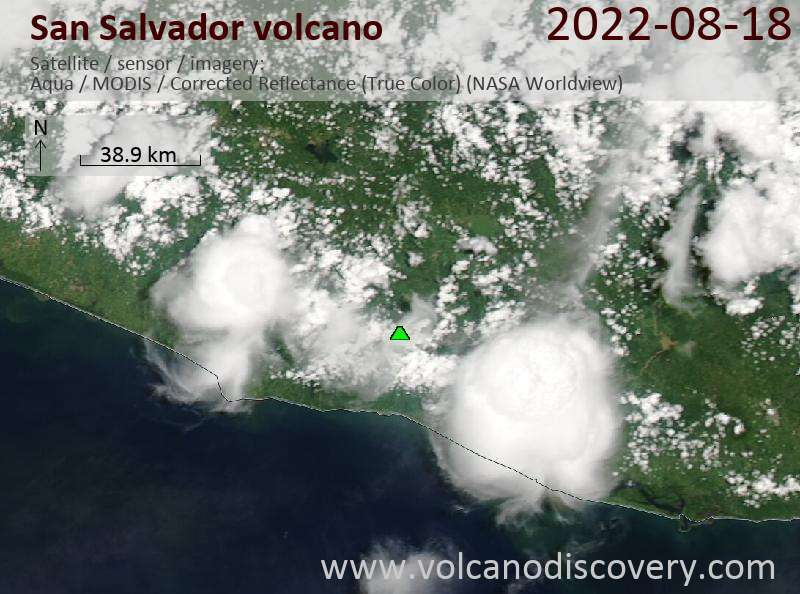 San Salvador volcano is a massive stratovolcano immediately northwestwest of El Salvador city. Its modern summit cone is also called the Boqueron stratovolcano. It formed within a 6 km wide caldera left by the collapse of the predecessor volcano about 40,000 years ago. Remnants of the caldera rim form the Picacho and Jabalí peaks. Boqueron volcano is truncated by a steep-walled, 500 m deep and 1500 m wide summit crater, which formed during a large eruption about 800 years ago. Before the last eruption in 1917, the crater of Boqueron contained a 400 m wide lake, which was replaced by a small, 30 m high young cinder cone, called Boqueroncito, built during the eruption along with a major lava flow on the north flank. Most historical eruptions from San Salvador originated from flank vents. Видны небольшие вулканические землетрясения и слабый тремор сейсмограммы, но в пределах нормальных уровней для этого активного вулкана. Вулкана Сан-Сальвадор — активный стратовулкан немедленно северо-западу от столицы Сан Сальвадор города и последний вспыхнули в 1917 году.